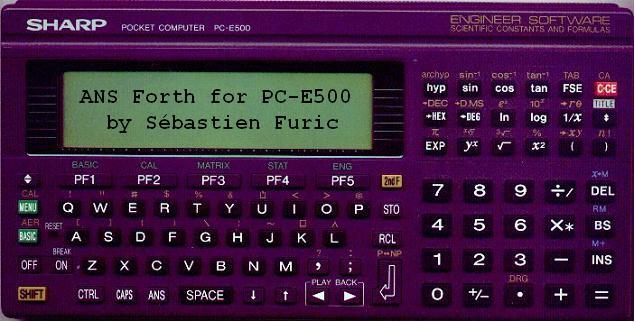 Sébastien Furic worked in developing a full ANS Forth compiler for the Sharp PC-E500 a few years ago (back in 2001-2003) and he was nice enough to send me (in September 2007) the source code and the materials to make it available here for everybody. This page is just a repository for Sébastien's work, I did not participate in this development and I can hardly help anybody in using or enhancing this great Forth compiler as I do not know the PC-E500 well myself. Thread #1575 (September 1st, 2007): Sébastien is still alive! Note: anybody having the knowledge and willing to help me enhance the repository web page for Sébastien's Forth compiler is more than welcome. ici tu trouvera un indice qui te metterons la puce à l'oreille.